If you’re on the lookout today for jewels that belonged to members of the imperial family of France, you’d best look not only in the Louvre but also in the family foundation of the Bernadottes, the royal family of Sweden. Like many of their grandest pieces, the gorgeous sapphires in their collection started out in nineteenth-century France. The parure’s first owner was Princess Augusta of Bavaria, the wife of Eugène de Beauharnais, the only son of Empress Joséphine. Augusta received the sapphires as a wedding present in 1806, and many think that the gifter was Eugène’s adopted father, Napoleon Bonaparte. If that’s the case, the set was almost certainly made by Marie-Étienne Nitot, Napoleon’s court jeweler. (The cameo parure, also owned by the Bernadottes, is also attributed to Nitot.) Augusta’s father, King Maximilian I Joseph of Bavaria, bestowed the Leuchtenberg ducal title on his new son-in-law, hence the tiara’s name. The parure includes a number of impressive sapphire and diamond pieces, including the tiara, a necklace, a pair of earrings, a brooch, and a set of hair ornaments. The tiara features diamond floral motifs topped by eleven sapphires. We’ve talked about the inflexibility of some tiaras, but this one is the polar opposite. The base is so flexible that the tiara lays completely flat when stored, making it both easy to transport and easy to wear. Queen Silvia talks about the sapphire parure, including the flexibility of the tiara, in this excellent documentary on royal jewels. The sapphires on the tiara can also be removed, and some believe that they were at one time interchanged for a set of large, pear-shaped pearls. The Leuchtenbergs had several children, many of whom made successful dynastic marriages. One of their daughters, Amélie, became Empress of Brazil, and inherited her mother’s diamonds and emeralds. 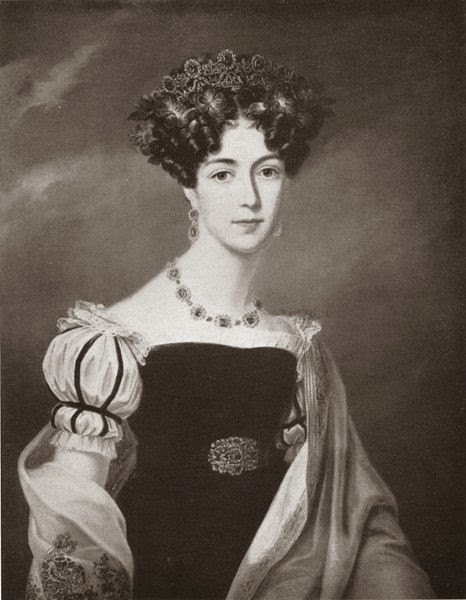 The eldest, Joséphine, married the future King Oscar I of Sweden, eventually becoming Queen Josefina. She’s the one who inherited her mother’s sapphires, and they’ve resided in the Swedish royal vaults ever since. For several generations, the gems passed through the hands of various Bernadotte family members. Josefina’s son, King Oscar II, inherited them from his mother in 1876. Five years later, Oscar and his wife, Queen Sofia, gave the parure to their new daughter-in-law, Victoria of Baden. Victoria wore the set regularly as crown princess and as queen, and she was photographed in the tiara and the rest of the parure. But rather than leaving the sapphires to any of her children or their spouses, Queen Victoria decided to preserve the set by bequeathing it to the family’s jewel foundation on her death in 1930. This is good for a couple of reasons — the main one is that the sapphires cannot be sold, but their presence in the foundation means that they are also available for more than one member of the family to wear. 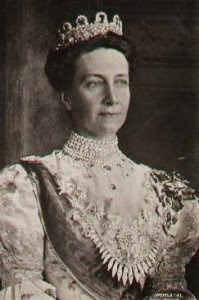 Even though they are theoretically available to all of the Bernadotte ladies, the sapphires have largely continued to be worn by Swedish queens. Queen Louise, the second wife of King Gustaf VI Adolf, made the sapphire tiara one of her signature pieces. But after her death in 1965, the country was without a queen for more than a decade. During that time, the sapphires were worn by Princess Sibylla, the mother of the current king, who served as first lady for her father-in-law. The set was also worn by Princess Birgitta at the wedding of the present king and queen in 1976. 1. Queen Silvia wears the sapphires at the Nobel Prize Ceremony on December 10, 1978. 2. Queen Silvia wears the sapphires at the Palace of Versailles on June 17, 1980. 3. Queen Silvia wears the sapphires at the Nobel Prize Ceremony on December 10, 2006. 4. Queen Silvia wears the sapphires at the Nobel Prize Ceremony on December 10, 2001. 5. Queen Josefina wears the sapphires in a portrait available via Wikimedia Commons; source here. 6. Queen Victoria wears the sapphires in a photograph available via Wikimedia Commons; source here. 7. Queen Louise (then crown princess) wears the sapphires during the celebrations of King Gustaf V of Sweden's 80th birthday in 1938; the man sitting beside her is King Haakon VII of Norway. 8. Queen Silvia wears the sapphires at a state banquet in Stockholm on April 14, 2008. 9. A version of this post originally appeared at A Tiara a Day in December 2013.